After visitors to Paris have seen the Eiffel Tower, they usually head to Île de la Cité, an island in the Seine, to see Notre Dame, one of the largest and most famous churches in the world. They usually don’t even notice nearby Sainte Chapelle, a “Holy Chapel” that many consider a more beautiful example of medieval church architecture. 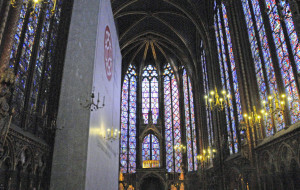 The two-story Sainte Chapelle was constructed between 1239 and 1248 by French King Louis IX adjacent his palace on Île de la Cité. The ground floor chapel, built for the palace staff, is impressive in its own right, especially considering that it was built almost 250 years before Columbus first left from Spain. Intersecting arched and gold-covered ribs support a ceiling painted to suggest a night sky. But it is the chapel on the second floor, originally accessible directly from the palace, which is the masterpiece. This chapel for the king and his court, now reached by a steep stairway from the first floor, includes sidewalls more than 50 feet high consisting largely of thousands of tiny pieces of stained glass illuminating stories from the Bible. Especially on sunny days, when the brightly colored glass visually overwhelms the narrow stone ribs supporting the roof, the vaulted ceiling seems to float ethereally above the walls. King Louis ordered the building of Sainte Chapelle as an elaborate reliquaryfor his most prized possession – a crown of thorns claimed to be the one placed on Jesus’ head before he was crucified 1200 years before. Louis acquired this relic in 1238 from its cash-strapped owner, Emperor Baldwin II of Constantinople, who had pawned it to the Venetians to secure a debt of 13,134 gold pieces. 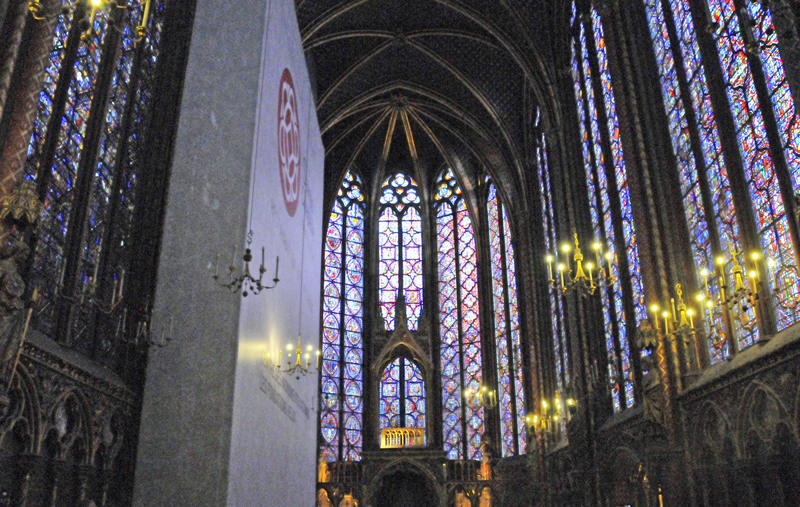 For all its unique and beautiful design, the construction of Sainte Chapelle cost Louis less than half as much as his crown of thorns. For his lifelong support of the church, including acquiring the crown of thorns, building Sainte Chapelle and serving in the Seventh and Eighth Crusades,which led to his death in 1270, Louis was declared a saint in 1297, the only French king so honored. The famous crown of thorns is no longer in Sainte Chapelle, its intended eternal home. It was moved to Notre Dame for safe-keeping during the French Revolution, where it remains. If you get a chance to visit Paris, after exploring Notre Dame stop by St. Louis’ magnificent chapel just a few blocks away. Since his palace in the Seine is now the French Palace of Justice, entering Sainte Chapelle requires first going through government security. But seeing such an inspiring achievement of human creativity is well worth the minimal effort and you will be glad you stopped.